Intro: Who is 3Summit Investment Management? Selecting a trusted investment manager is not a simple process. Whether you are an individual or institutional investor, it pays to be cautious when choosing someone to manage your assets. To create a successful financial plan, an investment manager needs to be up-to-date on current industry trends, employ intuitive management processes, and be invested in providing personalized, thoughtful services. Just as no two investors will have the same portfolio, no two investment managers will have the same approach, and you’ll want to ensure that you choose the right approach for your finances. Based in Fairfax, Virginia, 3Summit Investment Management is a fee-only independent advisor providing investment management services to clients in the Washington DC metro area and across the country. Formed in 2016, 3Summit is a small and relatively new investment management firm. Led by Dan Irvine, president, and Eric Reed, investment operations, the firm prides itself on “leveling the playing field” through providing sophisticated, customized, and high-quality investment services to two often-overlooked groups: individual investors and small institutions. 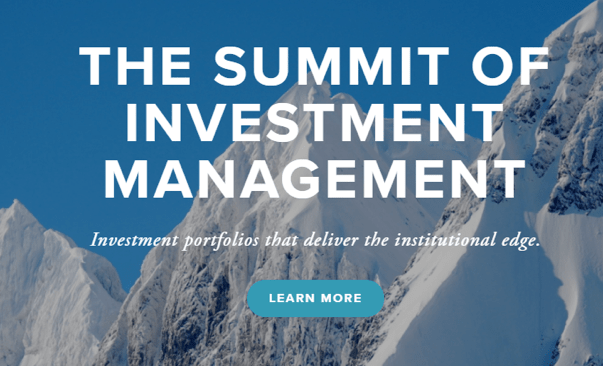 With a comprehensive, expert approach, 3Summit is poised to provide valuable investment management services for individual investors, small institutions, and Registered Investment Advisors. 3Summit Investment Management is a fee-only, independent advisory firm that has adopted the fiduciary standard, which is excellent news for current and future clients. As a fee-only firm, clients can rest assured that 3Summit will only charge a set asset management fee to act in their clients’ best interest, without incentive for personal gain. This means that the firm does not receive commissions for selling annuities, insurance products, or any specific financial securities, minimizing risk and ensuring that clients receive unbiased investment management every step of the way. With a fiduciary responsibility and a fee-only payment structure, 3Summit is committed to providing the transparency and ethical foundation to build fundamental trust between themselves and their clients. See the table below for a quick look at the firm’s fee structure. While evaluating investment management firms, many clients find that it is extremely important to find a firm that is firmly rooted in a value-driven philosophy. 3Summit Investment Management defines three groups of clients served: individual investors, small institutions, and independent investment advisors. Although 3Summit keeps a minimum requirement of $350,000 for their client base, the firm is open to waiving this account minimum at their discretion. Below, please find a detailed overview of how 3Summit defines each specific client group, and their unique value offerings for each client type. By partnering with 3Summit, individuals, high net worth investors, and families can benefit from institutional-quality investment services, helping identify and reach their financial goals. For small institutions, 3Summit provides high-quality, sophisticated investment strategies that are typically only available for high net worth individuals or large corporations. Their investment strategies are uniquely tailored to assist institutions with controlling their risk and meeting their financial objectives, both present and future. For startup and established independent investment advisors, 3Summit provides an intuitive platform to help Registered Investment Advisors differentiate themselves and deliver cutting edge investment management solutions. Ultimately, the goal is to empower independent RIAs to successfully manage their client relationships and strengthen their business model through a partnership with 3Summit. 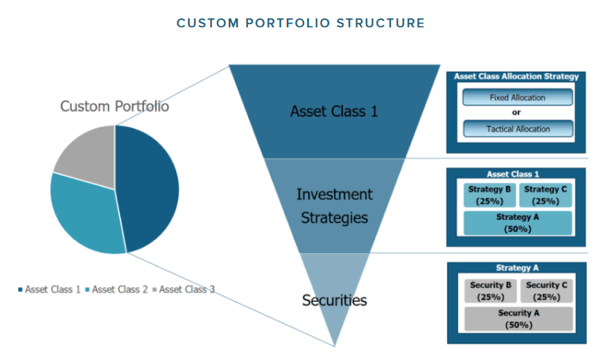 Upon signing up for portfolio management services, clients will receive an Investment Policy Statement outlining unique risk tolerance levels. Depending on portfolio diversification needs, 3Summit may employ additional types of securities to provide the best results. In an homage to founder Dan Irvine’s home state of Colorado, the name “3Summits” comes from a trio of 14,000-foot mountains named Lincoln, Democrat, and Bross. For 3Summit Investment Management, the challenges of climbing a mountain mirror the inherent challenges faced by successful investors. As such, these three mountains embody not only the firm’s namesake, but metaphorical pillars, creating a strong foundation for the firm’s investment strategies and key differentiators, detailed below. These institutional investment capabilities also include a custom portfolio structure for each client, as detailed in the image below. For 3Summit Investment Management, comprehensive risk management involves employing a collection of risk factors to ensure that each portfolio is tailored for optimum performance. Part of this comes from Risk Partitioning, a strategy which allows 3Summit to manage complex financial situations. With Risk Partitioning, a single investment account is handled with multiple investment objectives and risk parameters, creating a truly comprehensive approach. 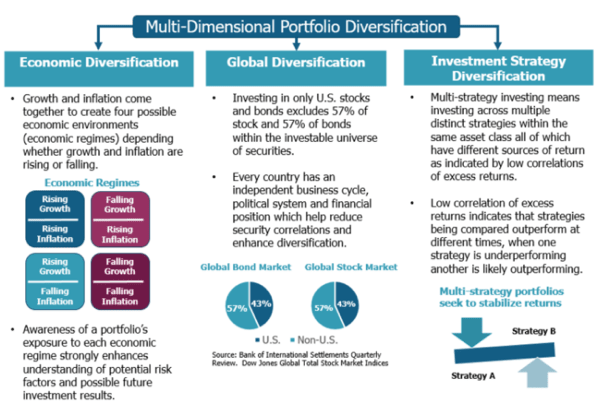 Comprehensive risk management also includes a multi-dimensional approach to portfolio diversification, outlined in the image below. Ultimately, comprehensive risk management means considering both short-term and long-term financial goals to find the best level of risk for each client, creating on a truly customized and individualized plan. For 3Summit, employing the highest standards of client care is just as multi-faceted as their sister summits. It begins with a fee-only, fiduciary standard, instilling trust between client and advisor. Standards for client care at 3Summit are further defined by cost management, asset protection, and transparency, outlined below. 3Summit prides itself on offering portfolio management fees that are below the industry average (around 1 percent of AUM as of 2017). To complement their commitment to low fees, the firm also diligently works to manage any other related costs, including fund management fees from third parties, trade commissions, and trade spreads. To keep assets secure, 3Summit does not take custody of client assets. Instead, Interactive Brokers acts as custodian for all accounts. Additionally, all technology and client information is kept safe using up-to-date security measures and protocols, ensuring that sensitive data is protected. Unique to 3Summit is their development of PortfolioPro, their proprietary portfolio management software. Led by founder Dan Irvine, a veteran financial software developer, it’s no wonder that 3Summit would develop an exclusive, intuitive investment platform to better serve their clients. As part of their commitment to setting a new standard for transparency, 3Summit provides multiple investment resources through their Thought Leadership portal. The firm also provides a blog and a quarterly client letter to help clients better understand current financial topics and trends, investment strategies, portfolio structure, and risk. Courage and confidence comes from knowledge. A foundation of knowledge of markets and the process of investing can help an investor develop greater market resilience and allow them to reach peak performance. How will 3Summit Investment Management serve their clients in the years to come, particularly with such a small staff? As any good investment manager knows all too well, attempting to predict the future is a near-impossible task. Additionally, 3Summit does not publish current assets under management, which makes it difficult to quantify present success. However, with approximately three decades of investment experience, exclusive investment software, and strong foundational values of high-quality service and client support, the future of 3Summit looks bright. Despite the firm’s small size and lack of published AUM, it’s worth noting that the measure of success isn’t necessarily about how much money is managed, but rather, from how well it is managed. Although staff support may be tight, the insular nature of a small advisory firm generates its own appeal. Clients are all but guaranteed to establish a genuine relationship with advisors, building trust and generating financial plans that are truly customized. Ultimately, positive predictions for future success can be seen clearly in their three summits, or core differentiators: Institutional Investment Capabilities, Comprehensive Risk Management, and Highest Standards of Client Care. With a strong foundation on expert investment strategies and tailored client portfolios, 3Summit Investment Management is poised to be a competitive option for individuals, institutions, and investment advisors alike.